Successfully Added Navigo - 7 Inch Touch Screen GPS Navigator to your Shopping Cart. The Navigo - a portable 7 inch touchscreen device that handles all the latest GPS software packages, comes with FM transmitter and Bluetooth functionality, and plays all your favorite audio and video files. The Navigo is a first class navigation and multimedia experience! Is that it? Not even close! The Navigo isn't just an amazing GPS device - it virtually transforms your car into an office on wheels with advanced features like Bluetooth and FM Transmitter functionality. Bluetooth lets you pair your cellphone with the Navigo. The FM transmitter allows you to output audio from the Navigo to your car speakers! How is this useful? Picture this: You're in the car, a call comes through. A quick tap on the Navigo's touchscreen and you're talking with your boss with both hands on the wheel. Whatever you say gets picked up by the unit's powerful and sensitive built-in microphone. Whatever your boss says gets broadcast through your car speakers. Is The Navigo a good car DVD player alternative? For those want to avoid the hassle and cost of installing a car DVD player into their vehicle, The Navigo is a good substitute. It has a large screen and plays multimedia files with ease opening up a world of entertainment options for you both inside and outside of your car. Imagine this. You're in the parking lot of the shopping mall, waiting for your wife to finish maxing out your credit card. c) You could watch Frodo carrying out his quest to destroy the One Ring on your 7 inch GPS navigator! Naturally, you choose c) and continue watching. Five minutes later, your wife calls and wants to get your opinion on a dress. Without missing a beat, you easily remove The Navigo from its car harness and take the movie with you. This is how perfect your life could be if you owned the CS36 Navigo! 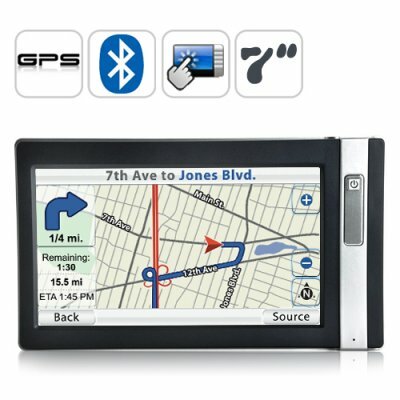 This 7 inch touchscreen GPS navigator with FM transmitter and Bluetooth is perfect for: family road trips, soccer moms waiting for the kids, car pool commuters, salesmen who spend a lot of time on the road, etc. So whether you're looking for improved driving satisfaction or looking to boost your online sales, add to cart, don't delay - and the good life could be yours right away. (We even ship next day!). This amazing 7 inch GPS navigator and other innovative devices are brought to you by the leaders in online China wholesale electronics - Chinavasion! Owning the CVOY-CS36 is like having a movie theatre in your car. The 7 inch screen is the same size as 2-DIN (100 mm high) car DVD player screens. With its 7 inch large screen and AV IN jack, you can easily output a DVD player or game system to this GPS device. Better yet, connect your rearview camera to the AV IN jack. Viable car DVD player alternative in that it has GPS, multimedia functionality, and Bluetooth. You don't have to pay to use GPS. The satellites which transmit GPS coordinates are maintained by the US government. You just need a GPS receiver to take advantage of the data. The Navigo contains a top of the line GPS receiver. Copy the software and maps onto an SD card. Insert it into the SD card slot. From the main menu go to SETTINGS. The first thing you will see are the settings for the GPS path. The GPS path is where the device looks for the GPS software. Click on the browse button (magnifying glass) and it will allow you to browse your SD card. Look for a file that looks like this: nameofGPSsoftwaremaker.exe where the first part of the file before the dot is the name of the software maker, and the part after the dot signifies that it is an executable file. Easy. From the main menu, click on the Bluetooth icon. Once in the Bluetooth menu, click on the PAIRING icon. Then from your cellphone search for Bluetooth devices. You're looking for a device called "GPS". The default pincode is 1234. Now you're paired and can start making and receiving mobile phone calls from your GPS navigator! How do I use the FM transmitter function? From the main menu click on SETTINGS. Once in the settings menu, you'll see three icons on the left side: GPS, Common, and Normal. Click on the COMMON icon. Along the bottom of the screen you'll see the FM icon which stands for FM transmitter. Adjust the frequency to whatever MHz you wish. For example 88.0 fm. That means all audio will be output to your car's radio on the 88.0 fm channel. Next turn on your car radio and turn the dial to 88.0 fm. Whether you're playing music, on listening to GPS voice instructions, all audio will now be sent to your car speakers!